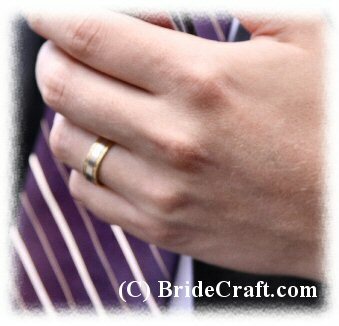 Choosing inexpensive wedding rings can be frustrating, especially when you are on a budget. Your rings represent an eternal bond, and you want the perfect design for you and your hubby-to-be. Can you have the unique, beautiful rings you want without spending your life savings? Whether you choose simple wedding bands or some other type of rings, there are options that will allow you to get a style and design you truly love at affordable prices. Wedding and engagement rings aren't all gold and diamonds anymore! Times have changed, and so have styles. Traditional designs aren't necessary - in fact, they are not even in vogue. To prove this point, just take a look at some of the wedding rings celebrities wear. In today's modern times, there is much more than gold to choose from. Platinum and silver are popular choices, and much less costly than gold. In past decades, the bride's engagement ring included a diamond. Not so any more! Other gems are becoming more and more popular - rubies, sapphires, and emeralds are emerging as beautiful options for both engagement and wedding rings. In fact, Princess Diana’s engagement ring was an incredible sapphire (the main stone) surrounded by diamonds…proving that sapphires are worth of royalty. Clarity, cut and carat is something you also want to consider when choosing a wedding ring. If you do decide to choose a diamond, certain cuts are more expensive than others. Also remember that the larger the carat, the more the engagement ring is going to cost. To many couples, a huge diamond isn't important. It is the love the ring symbolizes that is truly meaningful. If cost is a major issue, you may want to consider using your grandmother's wedding or engagement ring. Heirloom pieces carry sentimental value, and often have intricate designs that are not found in more modern jewelry. Many couples decide to use jewelry that has been handed down through generations as their wedding rings. If you and your significant other decide on wedding bands, they are less costly than rings containing stones, pearls and other gems. A simple gold band is the choice for many couples, and the meaning just as deep. Wide or narrow, wedding bands signify an unending, eternal circle of love. Another option you may want to consider when researching inexpensive wedding rings is having your rings made. This can be very affordable if you (or both of you) have some old jewelry that can be melted down. Jeweler's can take old gold, platinum or silver jewelry and gemstones, and make you a completely original and unique piece of jewelry that is absolutely exquisite. Wedding bands can easily be made for a fraction of the normal cost if bride and groom both have old gold that can be melted down. If you insist on buying your engagement ring new, do some research. Prices vary widely, and you may be able to find good deals online if you are comfortable doing so and find a reputable seller. Your rings are a symbol of your love and commitment. Consider them as such, and not so much as a fashion statement or symbol of wealth. Take some time to look at unique and alternative ring ideas and consider what is right for you and your fiancé when choosing inexpensive wedding rings. 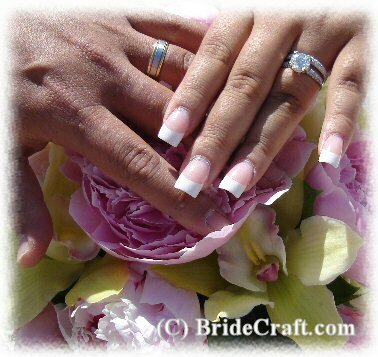 Return Inexpensive Wedding Rings to Wedding Article Library.